Students listen to a presentation about the Gensler Architecture Firm and the Bushwick Hotel project. 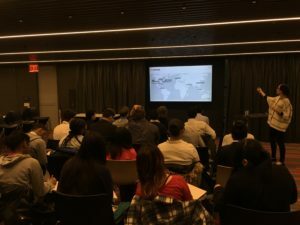 On March 3rd, WHSAD students visited Gensler Architecture Firm in Brooklyn to learn about a new project that will allow students to gain real world experience collaborating with real architects. This project involves students designing the lobby of the Bushwick Hotel. 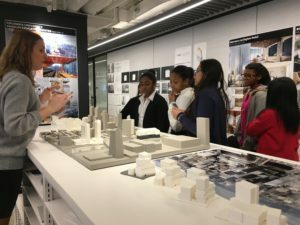 While at Gensler, students met with Anne-Sophie Hall, a lead architect at the firm. Ms. Hall introduced students to other projects that the firm is currently working on and took the students on a tour of the offices. The 2016-17 school year marks the second year in a row that WHSAD students have worked with the Gensler Architecture Firm. WHSAD is able to participate in this project because of the efforts of Toby Moskovits, a real estate developer and founder of Heritage Equity Partners. She has been working with WHSAD for the past two years, and has provided our students with opportunities to partner with architecture firms and gain real world experience. 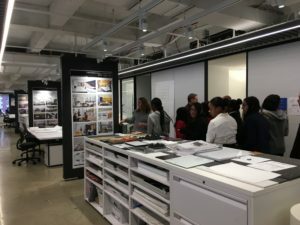 Students were given a tour of the offices where they learned about various projects Gensler architects were currently working on.